As far as I am concerned, Durga Puja kicks off the festive season. The first big celebration before Diwali, Kali Puja and then the grand finale of Christmas. As a self-respecting NRI mother, I dust the cobwebs off my sarees, kit the kids out and make way to the nearest pujo pandal. But not before I have seized the moment to teach my errant toddlers the story of Ma Durga. I sit them down in their fake Shah Rukh Khan / Karisma Kapoor outfits and start the search. Thank mercy for YouTube, I smile. If there is one place for a suitable animation of the story of Goddess Durga and all her incarnations, this is it. YouTube, as it turns out, is not the go to place for suitable. I watched as the Goddess of Strength in my animation of choice partook in a blood bath, where splodges of tomato ketchup landed here, there and everywhere. With every raised spear and splodge of colour on the screen, I watched the bundles turn a paler shade of brown. When the asuras heads ended up in her grips along with the blood stained weaponry, I spotted that ominous “see you at night time look”. I finally dived forward and switched to a furry oversize puppet singing the ABC song. Next time I’ll just tell the story without the quasi horror visual gags. There is no better excuse to try something a little out of the comfort zone than during the festive season. For Durga Puja, I didn’t venture much further than the special Bhoger Khichuri of course. 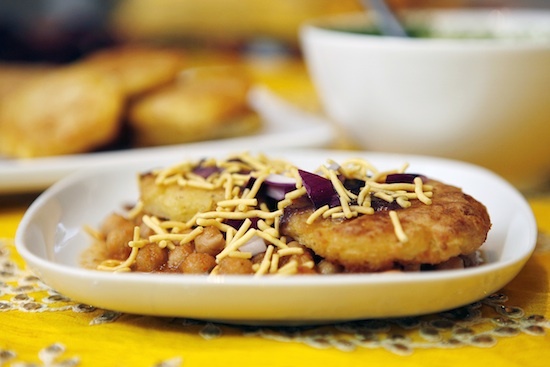 But for Diwali, I turned my attention to a slightly more tricky Aloo Tikki Chole, a spicy, tangy snack of potato cakes on a bed of chickpea curry doused with sweet and sour chutneys, topped with crunchy onions and crunchy gram flour noodles. I say tricky, because it involves the preparation of four different things, not forgetting the need for a number of specialist ingredients that require a focused trolley dash. This, in my life, is the almighty faff that only festivity can justify. Only just. The key here, as with most Indian cooking, is in timing. Cook the aloo tikkis under a hot grill, so that you can be getting on with preparing the other bits and bobs. And make the chutneys the day before, so that’s one less thing to think about. First get the aloo tikkis going. Peel and boil the potatoes until they fall apart when you insert a knife into one of them. This should take about 20-25 minutes on a rapid boil. Drain, cover and leave to cool (I like to save the potato water for adding to the chole later). Whack the grill to a high setting, then simply use your hands to mix the cumin, chilli powders and salt into the potatoes. Grab a pin pong ball sized amount of the potato mix, flatten in your palm and fashion into disc. Next place on a lined and lightly oiled baking tray and stick under the hot grill for about 30 minutes, 15 on each side. They should be golden brown on either side. For the chole, peel and puree together the onion, ginger and garlic. In a large non-stick wok or kadai, get the oil to sizzling on a high heat and tip in the pinch of asafoetida. As it sizzles up, mix in the onion paste. Stir this paste for 10 minutes until it starts to take on a golden colour. Now, chop up the tomato or puree it in the blender, and stir it in, along with the cumin and chilli powder. Saute this for another 10-15 minutes until the aroma of the spices change from raw and pungent, to a more pleasing one altogether. Next, drain and rinse the chick peas and chuck them in, along with two cups of (potato) water. Then reduce the heat to a low-medium and let the chick peas cook for another 10-15 minutes until you get a thicker gravy and oil oozing out of pores on the surface of the curry. Finish by stirring in the garam masala, amchur or chaat masala and adding salt to taste. Resist the temptation to add these earlier as the chole will just go bitter. To serve, simply leave bowls of the garnish, the chole, the tamarind chutney, the green chutney and a platter of aloo tikkis out for everyone to help themselves. Ladle the chole on plates first, place the aloo tikkis on top and then garnish with the toppings for your aloo tikki chole. Mallika, love the way you’ve described yourself as the ‘self-respecting NRI mother… it’s so much like what happens in our household – only difference being you’ve got more pandal options in London so that you can hop into the nearest pandal! Do you not put anything in the Tikkis to bind them? This is the only problem that I face when I try to make these at home, the Tikkis break. I’ve nowadays resorted to use frozen Rosti Patis that are available in the supermarkets. I know that’s big time cheating! Ha ha ha, your post made me laugh, esp where you mentioned the kids’ outfits. Sometimes we behave like the Indian roles/types we don’t really want to be seen as, don’t we? I wouldn’t mind looking like Karisma Kapoor, though! This looks lovely! Have a great 2014 and best wishes to you and your lovely family!